Why Businesses Need Programmable Communications? Software has transformed the way we do business. But communications is one area businesses find difficult to innovate with software. Twilio solves this problem. A communications divide exists between how people talk to people vs. how businesses talk to people. When you call your friends, they would never ask you for your mother’s maiden name. Or greet you with a recorded message prompting you to press 1 to meet for lunch or 2 to go see a movie. (If they did, you would consider recommending them to a doctor.) Instead, you choose to communicate using any method that suits your convenience. If it’s not urgent, you simply send a text or an email rather than being forced to call. But when it comes to talking to a business, the experience is very different. When customers try to reach your business, they might have to jump through hoops to connect with the right person or get the right information. They are restricted to the communication choices that your technology and processes can support. And when you try to reach customers, they don't pick up the phone or open your emails. Communicating with customers shouldn’t be this hard. Good communication is fundamental to human activity and vital to building great businesses. While software has transformed entire industries, communications technology has largely failed to evolve. In fact, the phone app on today's smartphones is a touchscreen representation of the push-button phone invented in the 1960s. This is because up until a few years ago, the barriers to incorporating communications into software applications were too high. The old approach was to start by provisioning expensive communications infrastructure that specialized engineering teams would spend months building and testing, while business teams negotiated contracts with local carriers to connect your infrastructure to the networks in each region. Only after many months—and hundreds of thousands of dollars—would you be able to start adding communications to your applications. Communications—especially calls, messaging and video—more often than not continues to take place in isolation. But conversations are more productive when they take place in the context of the application, bolstered with relevant information, whether it’s a ride-hailing app, a website for hotel booking, or a support call for a lost credit card. Twilio gives businesses the software building blocks to create an integrated communications experience. 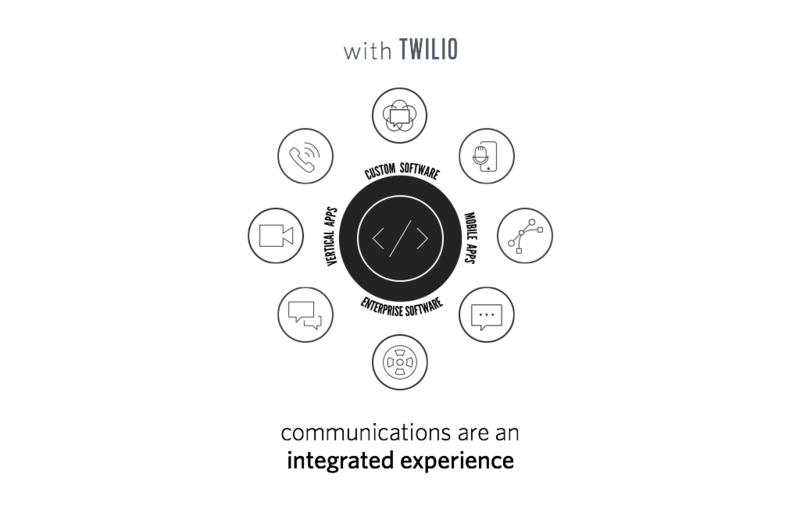 Twilio has taken the global telecom network and turned it into a communications API. Developers use web languages they already know to create communications experiences that were previously not possible. Information available in software systems is used to route communications to the right person and even things, over the preferred communication channel. This way, you can focus your resources and time on tailoring experiences, not building communication capabilities from scratch. The Programmable Communications Cloud enables you to embed voice, messaging, video, and authentication capabilities into your applications via simple-to-use APIs. We provide the building blocks and infrastructure so your teams can focus on creating tailored user experiences for your customers. The Super Network allows your software app to communicate with connected devices globally. It interconnects with communications networks around the world. We continually analyze data to optimize the quality and cost of communications that flow through our platform. A Business Model for Innovators encourages experimentation. With Twilio, all you need to do is sign up and start building your prototype. You can pay as you go, and scale on demand, no contracts or upfront licensing fees. The Twilio platform is constantly enhanced so that businesses can keep up with and adapt to changing customer communication preferences. We shipped over 6,000 updates in 2016. Over million developers use the platform to create transformative experiences using common web languages. No specialized skill set is required. I am not a Developer, what can I do with Twilio? Software is disrupting industries and transforming products and services. Development teams are now defining how organizations engage with their customers. As a product owner, business manager, or innovation leader, you constantly think about how your organization can deliver more convenient customer experiences or streamline operations. Businesses are using Twilio to bridge the communications divide. Programmable communications allow you and your development teams to orchestrate the right communications experience for your customers. Explore how companies like Airbnb, Nordstrom, and Zendesk are using Twilio. Discover what you can do with Twilio. Ask your development team if they have tried using Twilio already. If not, sign them up for a free trial account.